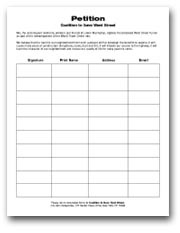 You can help by distributing copies of our position paper, our fliers, and by helping us collect signatures for our petition. Just click on the links below to download and print. 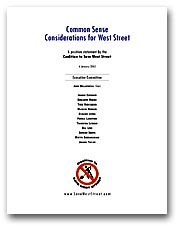 This 12-page, non-technical document explains the reasons for community concerns about several proposed treatments of West Street, and describes alternatives that can achieve the same objectives more quickly and easily, at far less public expense. Please download this important document and distribute copies to those who may have an interest in the future of our community. 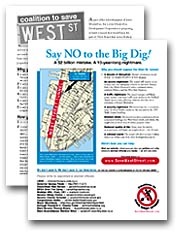 These informative 1-page fliers describe how the proposed West Street tunnel would affect your neighborhood, why people who live and work here are opposed to it, and what you can do to help. Send them to friends and neighbors. Post them on bulletin boards at work. Place copies at the concierge desk of your building. Help us spread the word. Our cause is growing quickly, but we must present evidence of that to show local officials how many people are opposed to the West Street tunnel. Documents above are in PDF format, which require the Adobe Acrobat Reader. If you do not have Adobe Acrobat Reader installed in your system, please click the link below to download this free plug-in. Have you signed our petition? If not, please click here to help strengthen our cause! Show your community spirit! Help a great cause! Click above to donate $1 to $50 by credit card. Every penny we receive goes directly to help save Lower Manhattan.